Wayne Turner is a diligent security guard who lives in a mobile home in rural Indiana. All Wayne really wants is a satisfying work assignment, a family that morally supports him, and perhaps a little hunting and fishing on the weekends. Yet for all his efforts to achieve his goals, what he winds up with are problems — arguments, pay-cuts, and overdue bills. Wayne throws himself further into his jobs — he even imagines himself gracing the pages of True Detectivemagazine. Yet his drive and obsession with work go unappreciated by his indolent family: his overweight, lazy wife Ethel tricks him; slovenly daughter Darlene disheartens him; and rebellious son Wayne Junior spites him. At the same time, the values Wayne believes in seem to crumble before his very eyes, and his employers, fellow employees, and family begin getting in the way of every step he takes. 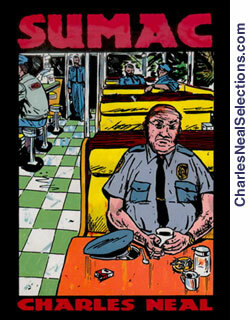 Sumac is the story of one simple man's ambitions and dreams, his trials and failures in trying to realize them, and the steps he takes to remedy the pain within him. And as any such story must be, it is funny, cruel, sad and violent. - Please include your name and shipping address, and the name of the book you are ordering.